This from mediabistro.com ,Wednesday 21. "I'm not sure that any product with a full, physical keyboard has ever had less justification for one... I'm also perplexed by the presence of so many hard buttons. If ever an application has ever cried out for an iPhone-style gestural interface, actually justifying what might otherwise be a lazy, component-availability-driven, flavor-of-the-week decision, it's this one." Jason Fried of the 37 Signals software company is having none of this naysaying, though. 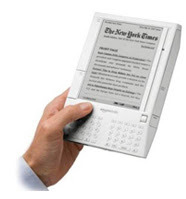 In his spirited defense of the gadget, he argues that, of all the complainers online, "few people had actually used a Kindle. And none of the reviewers had a chance to live with one yet." Also, "the permanence of books" is "overrated and over-romanticized," and the Kindle at least points the way to a bright, shiny future. So there.